CANTON, Mass. 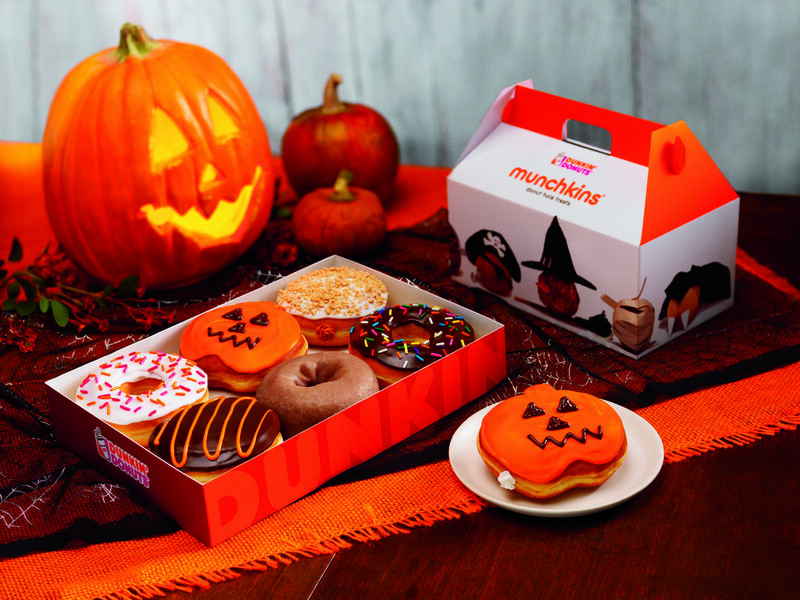 (September 30, 2014) -- October is shaping up to be a treat for Dunkin’ Donuts guests, as the brand today unveiled a seasonal addition to its famous donut lineup, the Halloween Pumpkin Donut. Shaped to resemble a jack-o-lantern, the new Halloween Pumpkin Donut features a vanilla-flavored, buttercreme filled, pumpkin shaped yeast shell, with orange icing and a jack-o-lantern face made with chocolate icing drizzle. It is available at participating Dunkin’ Donuts restaurants nationwide through October. Dunkin’ Donuts has also introduced two new menu items that on-the-go guests can enjoy throughout October, any time of day. Dunkin’ Donuts’ new Snack N’ Go Chicken Wrap features a tortilla filled with breaded chicken and ranch sauce with a slice of bacon and white cheddar cheese. Dunkin’ Donuts is also rolling out something special for bagel lovers, introducing the new Spinach Artichoke Supreme Bagel. Served warm, the Spinach Artichoke Supreme Bagel is a plain bagel with a spinach, artichoke and cheese topping. Both are also available for a limited time at participating Dunkin’ Donuts restaurants. With the weather turning cooler, Dunkin’ Donuts is bringing back a hot chocolate favorite, with the return of Salted Caramel Hot Chocolate. Dunkin’ Donuts’ Salted Caramel Hot Chocolate offers a blend of sweet and salty flavors in every sip. Dunkin’ Donuts also serves several other varieties of hot chocolate to help people on-the-go treat themselves throughout fall, such as Original, Mint and S’mores and our Dunkaccino®. Pumpkin Coffee and Lattes: Dunkin’ Donuts celebrates the season by adding the taste of pumpkin to its world-famous coffee and lattes. Dunkin’ Donuts offers three varieties – Pumpkin, Pumpkin Mocha or Pumpkin Crème Brulee -- served hot or iced. Pumpkin Pie Donut: This returning treat features a pumpkin pie flavored buttercreme filled yeast shell, frosted with white dipping icing and sprinkled with graham cracker topping. Pumpkin Donut and MUNCHKINS® Donut Hole Treats: Guests can savor the season with the glazed pumpkin cake donut, which can also be enjoyed as MUNCHKINS® donut hole treats. Pumpkin K-Cup® packs: Available at participating Dunkin’ Donuts restaurants nationwide for $9.99, this variety of the brand’s popular K-Cup® packs, for use with the Keurig® K-Cup Brewing Systems, allows people to enjoy the taste and aroma of pumpkin, nutmeg and cinnamon found in Dunkin’ Donuts Pumpkin Flavored Coffee in individually-sized portions at home.